John Friesen has won prizes at the Montreal Symphony Competition and the Eckhardt-Grammatte National Music Competition. He is a recipient of Canada Council Awards and the Lincoln Center Fund Awards and has been heard on CBC national radio and television, CTV national television, WNYC Radio (New York) and BBC Radio (UK). 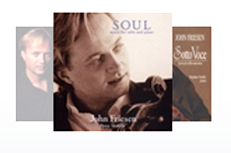 Aside from the world of “classical music,” John has collaborated with musicians in the fields of popular music. He has performed solo cello on kd lang’s, Grammy award-winning album, “Ingenue,” as well as in movie music, performing music for Oscar-winning actor, Ben Kingsley’s, “Fifty Dead Men Walking” and Amy Grant’s, “A Song from the Heart.” He has also collaborated in the electronic music idiom, appearing with Corey Fuller on the 12K label and Dragon’s Eye Recordings. After earning a bachelors degree at the University of British Columbia with Eric Wilson he obtained a masters degree at the Juilliard School in New York under Harvey Shapiro and Channing Robbins. He went on to complete a doctorate at the University of Southern California in Los Angeles with Lynn Harrell. He is currently an Associate Professor of Music at Western Washington University as well as a Professor of Music at the University of British Columbia. He plays on a cello made in 2000 by Mario Mirralles. He and his wife have three children. © 2012 Sono Records. All Rights Reserved.